There aren’t many people who don’t appreciate a good holiday. And in today’s world, the best holidays are the ones that combine celebration of an event or an ideal with an extra layer of symbolism and participation. These are the holidays that encourage people to commemorate important moments from the past, rather than simply remember what happened many years ago. Think about Thanksgiving, for example. This holiday was originally observed as a way to remember the struggles and triumphs of the earliest American settlers. In 1863— right in the middle of the American Civil War—President Abraham Lincoln delivered a proclamation that established what we currently observe as the national day of Thanksgiving on the fourth Thursday of November. at contemplating the value of being thankful on a philosophical level. We get to eat turkey! We get mashed potatoes and green beans and cranberry sauce and pumpkin pie! We also gather together with the people we love most so that we can feel the warmth of giving thanks on an emotional level—so that we actually become thankful even as we celebrate Thanksgiving. Something similar happens within the church when we celebrate the baptism of a new disciple of Jesus. No, disciples don’t get baptized every year. But the rite of baptism itself is very much a participation and a commemoration of something, rather than a simple ritual—specifically, it’s a commemoration of a person’s salvation. What’s one of your favorite holidays? Why? How would you summarize your earliest impressions of baptism within the church? As we take a deeper look at the practice of baptism within the Scriptures, we’ll see that it’s much more than a celebration or even a commemoration. Indeed, baptism is our first act of obedience as disciples of Christ. to sin still live in it? 3 Or are you unaware that all of us who were baptized into Christ Jesus were baptized into his death? 4 Therefore we were buried with him by baptism into death, in order that, just as Christ was raised from the dead by the glory of the Father, so we too may walk in newness of life. 5 For if we have been united with him in the likeness of his death, we will certainly also be in the likeness of his resurrection. 6 For we know that our old self was cruci ed with him so that the body ruled by sin might be rendered powerless so that we may no longer be enslaved to sin, 7 since a person who has died is freed from sin. 8 Now if we died with Christ, we believe that we will also live with him, 9 because we know that Christ, having been raised from the dead, will not die again. Death no longer rules over him. 10 For the death he died, he died to sin once for all time; but the life he lives, he lives to God. 11 So, you too consider yourselves dead to sin and alive to God in Christ Jesus. What do you like best about these verses? How do these verses contribute to your understanding of baptism? Not to be confused with MSG (bad), PSGs (good) are an essential discipleship tool for small groups. 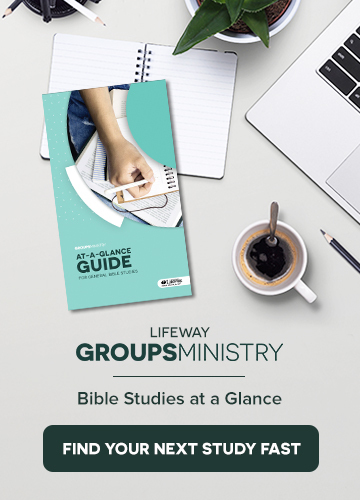 The PSG (Personal Study Guide) is an important part of the group Bible study experience. Discipleship doesn’t take a day off. You know as well as I do that people attend Bible studies sporadically. People are often present one week, then absent the next two weeks. But if that person has a PSG, they can continue to read, study, and respond to God’s Word between Bible study sessions. Just because the person is absent doesn’t mean they should take time off from being immersed in God’s Word! The group experience is better with PSGs. Having a PSG before the group meets for Bible study makes it possible for group members to read and study ahead. They can jot down questions, respond to statements made by the author, and mark words or phrases for which they need more clarification. Coming into a group Bible study “warmed up” helps every member get into the Bible study. PSGs give group members plenty of material to jog their thinking, challenge their understanding, and apply biblical principles to their lives. The PSG helps guests fit in. Savvy churches are handing out PSGs at their guest centers and in their small groups. When a person fills out a guest information card, they are handed a PSG. The PSG is theirs to keep, whether or not they attend a group. Having PSGs at greeter stations sends a healthy signal that the church cares for its members and guests, invests financially in people’s spiritual growth, and raises expectations about what will take place in the Bible study groups. It’s difficult to get visitors to attend a Bible study group; fear of the unknown often keeps some people away. But having a PSG in advance puts the guest on a level playing field with every other member of the group. The financial investment is fantastic. A PSG produced by my company costs approximately $2.65 per person. Before you say “that’s a lot of money” (because you may be purchasing them for hundreds of people), consider this: each PSG contains 13 complete Bible studies. By doing the math, this means each session costs $.20! There is no other resource to help people mature in their daily walk and nothing more economical to create better group experiences than the Personal Study Guide. Ken Braddy is manager of LifeWay’s ongoing Bible studies. He leads a weekly Bible study group at his church, and blogs daily about Sunday School at kenbraddy.com. For example, some small groups gather to study the Bible in a way that is tied to the message preached at the service. Using a discussion guide written by the discipleship pastor, group leaders facilitate a discussion based upon the message from the service. Proponents of this method often view the weekend message as the “front door” to the church for a guest. Studies like these help draw in those marginal attendees and make for a more comfortable experience for them since the discussion is based primarily on what everyone heard at the service. Still other churches let their group leaders plan and teach what they want. They might choose a video-driven study, a short-term study on a given topic, or a book of the Bible. Or, they might subscribe to receive Bible study curriculum from trusted sources, published by LifeWay. Whatever way they choose, group leaders have freedom in this environment to chart their own course for their groups. Still others might prefer to plan out a long scope and sequence for their groups to study. They might choose to walk through certain books of the Bible for a year, choose various topics to study, or do both over a longer period of time. Planning and purpose are very important variables for churches that take this approach. With so many ways to set up a small group ministry, there are also many products to help support them. One web-based tool, smallgroup.com, gives churches and their group leaders the ability to create studies for all of these scenarios. Sermon-based groups can quickly customize existing studies to fit the message; church leaders can grant all of their group leaders access to create their own studies; and church leaders can build a scope and sequence by text or topic—or both—for as far out into the future as they please. Regardless of how you set up your groups or equip them study God’s Word, the important thing is that they are studying God’s Word. “All of the Bible is always good, all of the time.” Enjoy studying God’s Word with your group this fall! SUMMARY: In this episode, Brian and Chris sit down with Eddie Mosley, the Small Groups pastor at LifePoint Church in Smyrna, Tennessee. Eddie is both an author and consultant for church small groups. Brian, Chris, and Eddie discuss the keys to a successful group launch. Eddie shares the importance of spreading out leadership opportunities to increase your leaders’ numbers. The three discuss the importance of numbers in groups, and weigh the pros and cons of taking attendance in a small group. In addition to increasing your numbers, churches must focus on deepening their relationships among their leaders. The key word for all of small group ministry is “relationships.” At his church, Eddie and his team strategically plan ahead through leadership training that encourages the building of relationships within small groups. GUEST: Eddie Mosley is the Small Groups pastor at LifePoint Church in Smyrna, Tennessee. Eddie is both an author and a consultant who travels around the country and teaches churches how to do groups. Eddie is the author of Connecting in Communities: Understanding the Dynamics of Small Groups. One of the churches in which I served sat on an interesting place geographically. The side of the main road where the building sat was quickly gentrifying: grand homes were being restored and flipped for big dollars, and the neighborhood was becoming a desirable place to live again. However, directly across the street was a completely different picture. Drugs and gangs were destroying families, and the crime rate was one of the highest in the entire city. While we felt pretty comfortable being on the “right side of the street,” we knew we couldn’t just sit and watch the pain occurring on the other side of our windows. This tension eventually led to a 24/7 Dream Center with a food pantry, dental clinic, after-school tutoring, free legal services, and much more, but it started with a handful of small groups who decided to love on and adopt a dying community. Those groups would consistently show up every month to walk the streets and offer basic needs, like lightbulbs, to as many houses that would open their doors. That community continues to change because those first few small groups took action. Changing a community is an admirable goal for a small group, but where do you start? How do you turn your group from inward to outward focused? Here are four steps to becoming a serving small group. If you expect your small group to become a serving group, you have to first model servant leadership for your group members. You can follow the example of Jesus with his small group. He served his disciples for over a year before releasing them to do ministry. As you start, make sure you serve them unconditionally and tangibly. There are no expectations attached with true servanthood. Even the disciples had to eventually turn over ownership to their quickly multiplying group. Spend a group meeting talking about where group members gifts and passions are, and then release them to own that portion of the group experience. There are always opportunities for groups to serve somewhere together in the church. A classroom needs to be painted. The church landscaping needs some extra care on a Saturday. The student ministry needs more bodies for an event. Take a few minutes at a group meeting to brainstorm ideas where the group can come alongside a ministry within the church. Just like our small groups saw a need across the street and met it, there are needs around your community. A single mom that needs her yard mowed. An under-resourced local school that needs more supplies for the teachers. A local fire or police station that could use some encouragement through baked cookies. Whatever you do may seem small or insignificant, but you have to start somewhere. The only way a community is going to be transformed is through one block at a time, by one small group at a time. In preparation for International Moment of Frustration Scream Day (October 12), we started listing things that might make a person scream, including a list for group leaders (Tuesday’s post), group members (yesterday’s post), and group guests. Not all groups expect guests, but many do. The life of open ongoing Bible study groups depends upon guest attendance. When traveling, I will sometimes attend a Bible study group as a guest. Here is a list of things that can make a guest scream with frustration. Make them walk across the room to find a chair. You enter the room (usually late because you had to find where the group met) and the only chair available is on the other side of the room. In some cases, the group leader is positioned right by the entrance to the space and there is no way to simply sneak in. Provide them a name tag that is different from everyone else’s. Everyone wearing a printed name tag lets me know I am not “in the club.” Handing me a red marker when everyone else has nametags in black also raises my suspicions. Let me be a part of your club! Put them on the spot. One way is asking them to introduce themselves. Did no one in the group catch my name earlier? If I didn’t share during the group time, why would I want to share now? There are so many more ways that guests can be put on the spot: the leader directs a specific question toward the guest, the guest is put in charge of an activity, or the leader asks a guest to read or pray aloud. Make it hard to participate. Having extra resources on hand makes it easier. Give the guest a Bible if needed. Make it possible for them to participate. If they want to keep the Bible or resource provided, let them. Tell inside jokes, stories, or terms. Every group has a code—the order of doing things and the way things are referenced make up part of that code. Experiences within the group also make up that code. “You remember how that worked out when we were building that playground for the community” means nothing to the person who didn’t even know the community had a playground. Don’t be so exclusive. Guests need you to clue them in—explain inside jokes or unspoken rules. Forget their name. Most of us expect people to remember our names. If your group has so many guests that you can’t remember their names ten minutes after you met them, then maybe it’s time to start a new group! Ignore them. It’s one thing to not put guests on the spot, but it’s another thing to ignore them altogether. If a guest wants to contribute to the discussion, let her do so. If he volunteers to read aloud, encourage him. After the group time is over, make the effort to talk to guests or contact them. We want to know that someone noticed that we were there! What other things might a Bible study group do that would cause a guest to scream out of frustration? What actions might you or your group take to minimize the potential for frustration among newcomers, and encourage guests to come back? October 5th is National Do Something Nice Day. It’s a nice sentiment (no pun intended), but it sounds like I’m off the hook the rest of the year. Shouldn’t we be nice all the time? National Do Something Nice Day right up there with February 17th’s Random Acts of Kindness Day. I’m not a fan of random acts of kindness. Don’t write me off as a curmudgeon. After all, my dad did raise me right. I hold the door open for people (not just women, thank you). I speak politely to the high school kid working the drive-thru. I rescue baby bunnies from the dietary plans of my beagle. When a need for kindness is right in front of me, I should take it. That’s biblical. Followers of Christ are commanded to clothe themselves with kindness (Col. 3:12). Kindness is part of the fruit of the Spirit (Gal. 5:22-23). We’re not being random when we encounter someone who could obviously use some kindness. Jesus told a story about a man who did an incredible act of kindness for a stranger. The parable of the Good Samaritan is about a Jew and a Samaritan, two men Jesus’ audience would have considered enemies. It was obvious to the Samaritan that the Jew was in a bad way—beaten and robbed—and he helped. That’s true kindness. Kindness is seeing a need and responding in a good, gracious way that benefits the one being helped. This captures the meaning of the Greek word and how it was used in the New Testament. It may feel kind to us to pay for the coffee of the person in line behind us, but the guy spending $4.75 for a skinny white vanilla latte probably is not in need of someone buying his coffee. The Samaritan didn’t pay the lodging bill for everyone—he paid for the one who needed it. Let’s be kind and let’s be nice—but let’s be intentional about it. Do it for those who could use the help or who need the encouragement. Don’t just be nice; through your intentional act of kindness, build a relationship. Show them the love of Christ in the process. Do it to honor Jesus, not to honor a national holiday. Dr. Lynn Pryor really is kind—even nice. He leads the team at LifeWay Christian Resources that produces the ongoing Bible study curriculum Bible Studies for Life. Follow him lynnhpryor.com. Some twenty years ago, a college friend casually entered the apartment I shared with three friends. He set his backpack on the ground, chatted it up for a few minutes, then asked if he could run upstairs and borrow something from a bedroom on his way out. Up and out he went. When my roommates and I turned out the lights and went to bed, we soon discovered that our friend had not just borrowed something from our bedrooms, but left us a gift. A few hundred gifts, actually. Hundreds and hundreds of crickets, chirping as if their lives depended on it. I think about this experience nearly every time I ask a question in a class or a small group and no one says anything. Figuratively speaking, all one can hear is the crickets outside. So what can you do to work through those awkward moments of silence in a group when they come? Here are a few tips. Share your questions with someone the day before. Every group leader should filter their questions through someone who loves them enough to tell them their questions are terrible. Sometimes silence is the result of a terrible question, and simply asking your questions ahead of time to someone who cares can go a long way toward avoiding awkward silences. Relish in the silence. Sometimes the best, most thought-provoking questions induce silence in the group. People have to think how or if they are going to answer it, because the implications for answering it might very well mean significant life change. Resist the urge to interrupt this kind of silence. Relish it. You just asked a winning question to which only silence can help bring about the answer. Be ready to answer your questions yourself. I recently asked a question in a class that I was sure was a good one, but no one else in the class felt compelled to take it on. Rather than dismissing it and moving on, I shared a personal story that illustrated the principle I was getting to underneath the question. Sharing that led to a number of other group members sharing because they had an example they could model. Sometimes silence works to our advantage, while other times it can wreak havoc on a group experience. With a little preparation, you can know the difference and either embrace it or obliterate it for the good of the group experience.